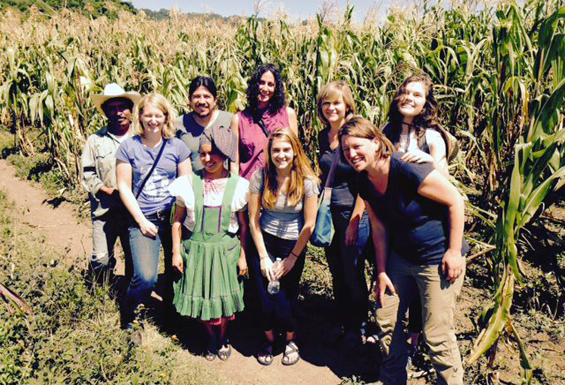 Last week we traveled to Chiapas, Mexico, and heard similar stories. A life-long corn farmer and his daughter invited us into their home. In his lifetime, he said, it has gotten hotter and there is less rain. A coffee farmer showed us where some of his leaves were spotted with La Roya and the new resistant plants he was trying to introduce. In Mexico, we also heard about the effects of NAFTA on farmers. 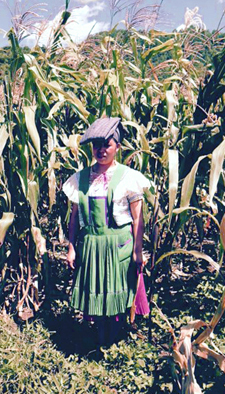 Maria and her father are growing corn and beans on about 1 hectare of land, split between an irrigated plot about a ten minute walk from their house and a rain-fed plot an hour and a half walk straight up hill from their house. They used to rent an additional plot of land and grew corn to sell, but since NAFTA, the market for corn has changed. They can no longer bring it to a government-run processing facility and get a decent price so they have stopped renting land, grow mostly for themselves, and sell for cash in a local market only at the height of the season. Maria’s family is not part of a farmer organization, but she has started a non-profit to assess and address the needs of the community and their farming model is based on sustainability and continuous improvement. 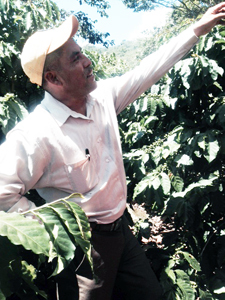 At Maya Vinic, a coffee and honey co-op, we were honored to meet Mariano, the new president. He told us that he did not know much about how fair trade certification worked and we would have to take questions about certification to someone else, but he told us very clearly that when Monika Firl of the fair trade importer Co-op Coffees arranged for the sale of their coffee in North America it changed everything for their co-op. Until that point they were able to organize farmers, assess community needs, and improve production, but until they had a market, they did not benefit from any additional income. We also learned about the communal land system in Indigenous communities and how it has become one tool to fight land-grabbing. Although it is technically legal to sell land to anyone, community rules require land that is part of the communal land holdings be sold only to other members, keeping outside buyers who may want lands for investment or for access to natural resources out. The take-away from all of this is that those of us fighting for a more just economy are on the right track, but we have a long way to go. Small-scale farmers are indeed feeding the world. They are hard-working, innovative, flexible, strong. They need to be given all that they face: land-use pressure, climate change, trade policies structured by and for large multinational corporations. Local community organizing efforts and global solidarity relationships are effective. But we still need to do more. We need to fight harder for trade policies that are fair for farmers, working families, and consumers. We need more people engaging in authentic relationships with small-scale farmers on fair trade terms, whether the end result carries a fair trade certification label or not. We need to do more work to connect the dots between the various obstacles to creating a more just economy, including land grabbing, climate change, and corporate consolidation of our food system. Newsletter 143: How much do you know? I’m interested in supporting cacao farmers in the soconusco region of chiapas Mexico. Your article is beautifully written and really drives the point home. With your permission I’d like to add a link to your article within marketing material. Also if you have any local connections that you think I should know about or even just to discuss our common blights.